The S&P GSCI Energy Total Return gained 8.1% in July, the most for a July in 13 years, led by petroleum that was up 9.2%. Finally the fundamentals may be showing the oil market is starting to rebalance with the rest of the commodities. The S&P GSCI Total Return had its best month this year, gaining 4.6%. lessening its year-to-date loss to -6.1%, while the Dow Jones Commodity Index gained 3.5% for a year-to-date loss of -2.1%. Three of five sectors were positive that included both industrial metals and precious metals along with best performer, energy. Also two-thirds or 16 of 24 commodities were positive for the month, the most since Sep. 2016, led by unleaded gasoline that was up 12.4%, its best month since Apr. 2015 and hottest July since 2005. Other top performers were heating oil, gasoil and coffee, with total returns up 12.2%, 11.8% and 10.9%, respectively. 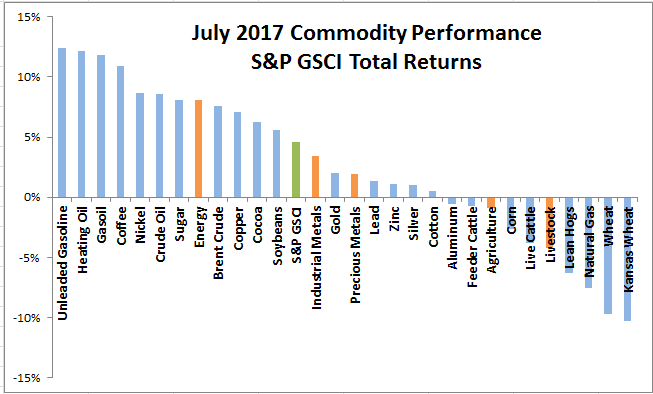 The biggest losing single was the S&P GSCI Kansas Wheat with a total return of -10.3% for July, its worst month in 2 years since July 2015. Given Brent and WTI crude oil together have just over 40% weight in the S&P GSCI, they contributed heavily, 3.4%, to the 4.6% gain in July. Although according to the International Energy Agency (IEA,) OPEC compliance fell to just 78% in June, they are hoping to improve compliance by capping Nigerian production. However, the cuts may be already be impacting the market as about 1 million barrels per day have been removed in addition to further cuts from non-OPEC countries. Also, a key factor in the oil price rebound is U.S. production may be starting to slow as companies reach drilling capacity and fear the risk of another drop in oil prices. This may happen just as Saudi Arabia cuts oil exports to the U.S., potentially accelerating the inventory reduction. 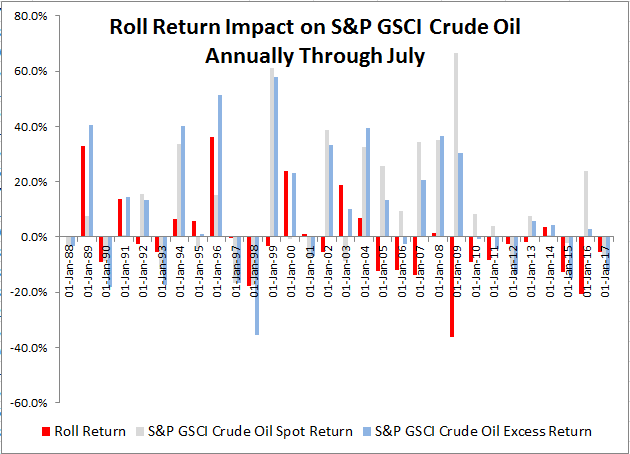 In July, the roll return, as measured by the excess return less the spot return, was -0.45% for crude oil. The negative roll return still reflects contango, a losing condition where near contracts are cheaper than later dated ones, mainly resulting from excess inventories with high storage costs. While the contango is still present, it is the least since Dec 2014, when the crude oil roll return measured -0.23%. The S&P GSCI Crude Oil Spot Return year-to date through July was -6.6%, but the total rolling loss (year-to-date through July) subtracted an additional 5.6% from index positions in the most liquid nearby contracts, dropping the S&P GSCI Crude Oil Excess Return to -12.2% in 2017. This is far less than the negative impact in the first seven months of 2015 and 2016 when the roll costs were -12.7% and -20.8%.